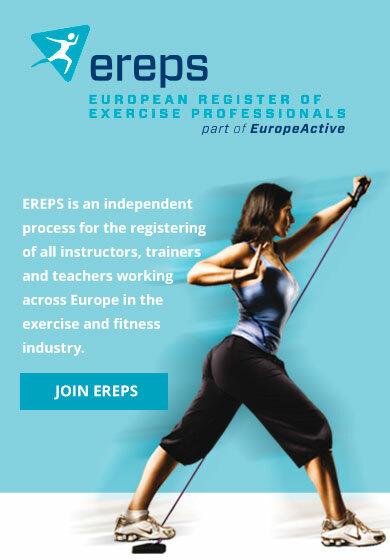 The European Register of Exercise Professionals (EREPS) is an independent process for the registering of instructors, trainers and teachers working in the European health, fitness and physical activity sector. It is a Pan-European system, based on independent national registers, which culminate in a central European database. Registration on EREPS gives an assurance that exercise professionals are qualified to do their job. This gives consumers, employees and partners in the medical and health professions the necessary level of confidence in their professionalism. EREPS is aligned to a number of National Registers simplifying the recognition of EREPS members working and travelling in Europe and throughout the world. The EREPS Affiliate Programme offers EREPS members the opportunity to access various fitness-related products and services at discounted rates. The offers included under this Affiliate Programme are part of EuropeActive’s mission to support EREPS members to be successful in their careers within the health and fitness industry. For more information on the member benefits click here. European operators are increasingly aligning themselves with EREPS through the EREPS Operator Champion Programme. This programme lets operators only employ high quality EREPS-registered employees. For more information on the EREPS Operator Champion programme click here. EREPS standards are regulated by EuropeActive’s Professional Standards Committee through the accepted European Fitness Sector Qualification Framework (SQF) which is referenced to the European Qualification Framework (EQF). The standards used for EREPS have been developed through extensive consultation and define the knowledge, skills and competencies that exercise professionals need to achieve registration. For more information about EuropeActive Professional Standards Committee and standards click here.